HIROSHIMA - A memorial service was held Sunday to commemorate the third anniversary of landslides that claimed the lives of 77 people in the western Japan city of Hiroshima. "I don't want anyone else to become a victim or a person feeling like us," said 77-year-old Takako Miyamoto, one of the speakers at the event. She lost her husband after torrential rain caused a series of landslides in residential areas close to mountains in the city early on Aug 20, 2014. "It is really painful and sad to have our lives ruined after losing everything, with our dear old houses destroyed," said Miyamoto, who also sustained a serious injury in the landslide. Touching on recent natural disasters in other places in Japan including torrential rain in Kyushu last month, she said she "sincerely hopes that no one else dies in a disaster." About 400 houses were either washed away or damaged in the Hiroshima landslides. 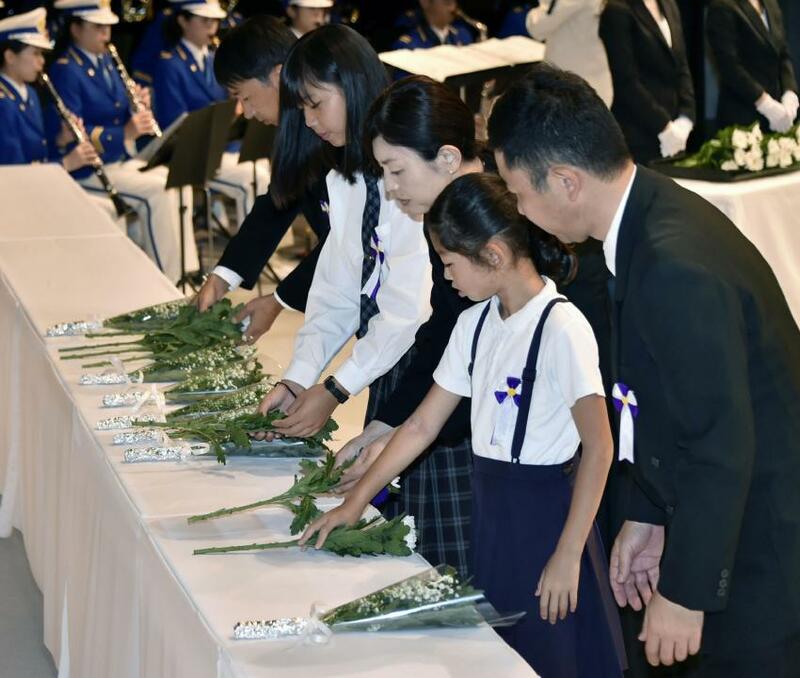 "Residents are providing mutual support and the work to protect each other has progressed," Hiroshima Mayor Kazumi Matsui said at the ceremony joined by some 600 people. "We'd like to support these efforts." The event was jointly hosted by the governments of Hiroshima city and prefecture in Asakita Ward, one of the hardest hit areas. Bereaved families and residents visited the devastated sites early Sunday to offer flowers and pray for the victims. Some rubbed the names of victims listed on a monument and put their hands together in tears. Residents of the devastated area were not informed of the landslide risk, as many of the sites were not designated as a warning zone in accordance with the law on prevention of landslide disasters. Following the disaster, the state revised the law and obliged prefectural governments to swiftly make public the results of basic investigations of terrain and geological conditions. The revised law came into effect in January 2015. The prefecture is expected to designate around 50,000 locations as landslide warning zones, but only about 40 percent of the areas had been so designated as of Aug 10.